St. Peter’s Health Partners Director of Community Health Programs Erin Sinisgalli, second from left, participates in ribbon-cutting ceremony for new lactation room at ShopRite of Albany on Wednesday, January 30, 2019. Breast- and bottle-feeding mothers now have two new private, secure spaces to feed their children in Albany County. 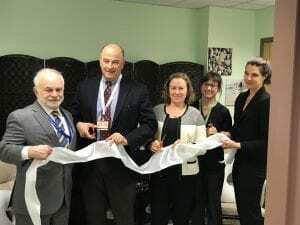 St. Peter’s Health Partners (SPHP) sponsored, and made possible, lactation rooms at Whitney M. Young, Jr. Health Center and at ShopRite, both located in Albany. Lactation room at ShopRite of Albany. The comfortably furnished rooms at both locations offer a more private space to breast- or bottle-feed, or express breastmilk. 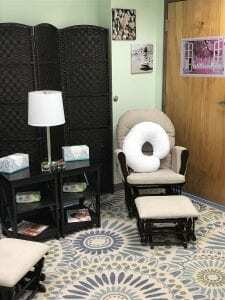 Outfitted with a rug, comfortable chairs, soft lighting, colorful artwork, and a white noise machine to drown out ambient sounds, these lactation rooms will serve many parents and their children well. Babies who are breastfed are known to have lower rates of infectious disease and be at a lower risk for Sudden Infant Death Syndrome (SIDS). Additionally, babies who are breastfed have been shown to have a decreased risk for certain chronic diseases, including asthma, diabetes, and obesity. Several studies have indicated that breastfed children may have significantly lower risk of childhood obesity, compared to those who were not breastfed. Lactation room at Whitney M. Young, Jr. Health Center in Albany. Because of these benefits, many organizations including the American Academy of Pediatrics, American Congress of Obstetricians and Gynecologists, World Health Organization, and the U.S. Department of Health and Human Services recommend exclusive breastfeeding during a baby’s first six months of life, and continuing breastfeeding until a baby turns one year old. The lactation room at Whitney Young is located on the first floor, around the corner from the main entrance at 920 Lark Drive. 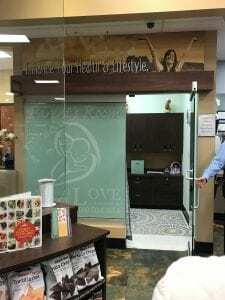 The parents’ room at ShopRite is located by the Pharmacy in the front of the store at 709 Central Avenue. In addition to being sponsored by SPHP, the new, state-of-the-art spaces were made possible through a New York State Department of Health grant, “Pediatric Obesity Prevention: Creating Breastfeeding Friendly Communities.” The grant is administered by SPHP Community Health Programs. For more information on the benefits of breastfeeding, click here. Ribbon-cutting for new lactation lounge at Whitney M. Young, Jr. Health Center on Monday, January 28, 2019.